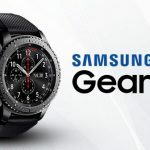 Samsung introduced its Gear S3 watches with IP68-certified design, GPS capability and advanced fitness features. 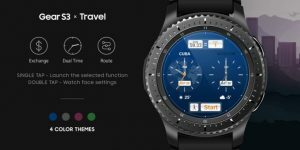 Recently Samsung launched three highly functional, activity-focused watchfaces thus making it even more easier for Gear S3 users to streamline travel, training and trekking the great outdoors. 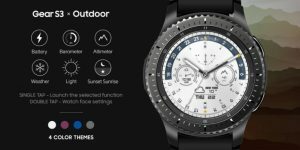 The Samsung Outdoor WatchFace is meant for users in outdoor situations whether its enjoying weather, conquering a hike or simply going for a stroll. The watchface includes an altimeter at three o’clock, a barometer at nine, a date and weather indication at six, and a sunrise/sunset display that arches over the screen. Tapping an indication once will access its app, while double-tapping will allow customization of various display-related settings. The watchface allows users to preset altitude and atmospheric figures. The Outdoor edition also features a dedicated night mode, and is offered in multiple colors, so users may customize their screen to their liking. The Travel WatchFace help business travelers and tourists to better manage their trips. The watchface’s customizable dual-time indications allows to easily monitor the time and temperature back home as well as in the current location, while the currency display at 12 o’clock offers easy access to the exchange rate. The My Journey indication rounding out the screen at six o’clock allows to keep track of distance traveled, and, when tapped, will open a detailed map to help navigate a new city. The Sports WatchFace helps players while training in their favorite sports. 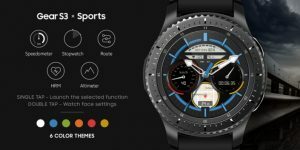 The Sports Watchface features a stopwatch at three o’clock and a speedometer at nine, along with a display for the user’s current heart rate and calories burned. The watchface also provides easy access to My Journey at the bottom of the screen, to help users map out runs and rides. Moreover, like the Outdoor edition, the Sports Watchface features a built-in alert function, designed to help users keep an eye on their exertion and exercise safely. The watchfaces are currently available for download in the Gear App Store.